The second season finale of Star Trek: Discovery is halfway over, with “Such Sweet Sorrow, Part 2” arriving next Thursday. We have already analyzed the trailer, and now we have some more details from one of the co-writers. It was originally just supposed to be one episode. We had thirteen episodes for the season and in trying to wrap up all the storylines and all the mythology, we developed the story — and the story was huge and the outline was huge and we realized it is not one episode of television. So, in order to do everything justice that we wanted to do – including all the character moments that we wanted to have – so, fortunately, our network partners said “have fun with another episode.” So, we did….There was so much story to tell and so much to wrap up and we really wanted to wrap up the characters’ journeys over the season and to try to squeeze that into one episode, we couldn’t have done it justice. I can say there will be a battle, because he [Saru] says “prepare for battle.” If we didn’t have a battle, we would be really bad writers. You don’t want to end an episode teeing that up, and then not do it. What I can say is the mysteries that we have been exploring over the course of this season will be answered in what I feel is a satisfying way. The character journeys that we have been on will also be addressed in what I hope will be a satisfying way as well. And more adventures to come. It is an exciting episode. I am so excited for people to see it. I just have to say for everyone for the whole two-part finale, everyone just brought so much to it, our cast, our crew. You [host Naomi Kyle] talked earlier about how it is basically a movie shoot, but we had TV time to do this movie shoot and our crew worked just so hard, day in and day out. Our actors were incredible. They brought their A game – A plus, A plus, plus, plus – every single day to every single moment. [Olatunde Osunsanmi] directed the two-part finale and just did an absolutely tremendous job with it. And enough cannot be said about our editors and our VFX people and everyone in the post department. When you watch it, it is everyone coming together every day and giving their best work and it shows on screen. Every part of it shows on screen. I couldn’t be more proud of how it turned out and how everyone turned out and made it happen, willing it into existence in a very tight time frame. I grew up watching the original Star Trek and in fact it was fun when I got this job I went back and back and started watching all the original episodes again. I didn’t get through all of them of course, but getting to go back and watch them again just reminded me how special the series is and it has so many different permutations now, but it all started with Gene Roddenberry and his ideas for looking up and looking to the stars and what it means when we are equal and when we’re judged by what we can do and not how we look or what species we are or anything like that. For me, the original Star Trek has a special place in my heart because of that…In terms of specific characters, I love Spock. The logic, the emotion, the constant pull of that. I find that not only dramatically interesting but just so human. Yes, I get that he is a Vulcan, I know that. But it is just such a human struggle and one that I relate to. It was really fun. Of course we have our underlying mystery and the thing that is driving us towards the end of the season – the signals and the Angel and all of that stuff – but coming into this season was really an opportunity to find ways to lighten the tone a little bit, to have our characters have a little fun. That kind of tonal shift was exciting. That is something that [executive producer/showrunner] Alex [Kurtzman] is always looking to do – can we infuse some fun into this moment, amidst the adventure and drama and cool action and awesome science, all of that stuff. It was really fun to be part of. I really enjoyed it. For lack of a better word, the AI that does its own thing is something that has appeared in sci-fi before and we were looking for a way to do that that would be unique to our show and organic to our show and challenge our characters in a specific way. Thankfully we found a fantastic actor [Alan Van Sprang] to embody that character. And over the course of the season just finding ways to make that character and that entity formidable was one of the things we were challenged by and excited to do. So, from the time we realized this is a problem to the time we lose Airiam as a result of that to the threats to our heroes, the threats to the galaxy, all of that – we were just trying to find ways that were unique to Discovery. In the full video, Paradise also talks about the USS Enterprise sets, Rebecca Romijn as Number One, bringing back Po for the finale, all the emotion with Anson Mount’s Pike and Ethan Peck’s Spock and more. Star Trek: Discovery has a lot of canon issues but this season did address those issues. I want season 3 to be set in the future. The show doesn’t need to be so close to TOS. This is what I hate about prequels. The Star Wars prequels had the same problems, how to connect them to A New Hope and the original trilogy and so on. George Lucas figured it out. Star Trek can do it too. The show is already set in the Future. “The show is already set in the Future”. Spock Jenkins not really. Discovery is set in the past in Star Trek canon. I’m talking about Star Trek history not the real world so that doesn’t apply. Which is still in the future. And the show has always had canon issues. And it’s always been fun ( in the past ) to reconcile those differences/discrepancies with wonderful, generous imaginative theories from the fans and programme-makers alike. Nowadays, it’s just toxic, with a certain section of fandom banging on about “THIS IS NOT CANON!” with the venom of a religious zealot. I remember the days when it was FUN to find plot holes and canon discrepancies and come up with reasons to reconcile them. There were BBS threads and entire websites and message boards dedicated to them. Ah, those were the days. You can’t blame CBS, Bob Orci, Alex Kurtzman, Bryan Fuller, or JJ Abrams, you can only blame the fans themselves for ruining the franchise. The fans are simultaneously the best and the worst part of Star Trek. Once upon a time nitpicking was fun and done out of a place of love, and Phil Farrand wrote books about it…. I have all the editions of those marvellous ‘NITPICKER’S GUIDES to TREK’ . Wonderful, and done with love and admiration, and a sense of fun. A world away from the ‘I know it all’ fan venom we are seeing today. “Discovery is set in the past in Star Trek canon”. = Discovery is set in the Past of the Future. LOL – you realise that is completely and utterly nonsensical. It makes sense in context with Startrek. The Picard show is set In the “presant”. I want Star Trek to be consistent. That means that all federation citizens have access to telekinesis since they only have to take a shot to get those powers. People can be fixed as good as new if they just keep a stand of their pre-transported DNA on hand, since Dr Pulaski was repaired that way. Nobody in the future can have any kind of repairs done to their brains, since McCoy said they can’t do that. Every person can be duplicated, since we saw that happen to Riker. Fermat’s Last Theorem Isn’t solved in the 24th century, even though it was actually solved in the 20th century. There will be federation Starships at the Galaxy’s edge constantly moniting to make sure nobody goes there to get godlike powers. “TOS itself had canon issues.” That is an apples and oranges fallacy. First, TOS was building the original conceptual universe, and the 60s time constraints put pressure on the the producers and writers to come up with episodes quickly, so continuity errors were bound to happen. The whole reason we got “The Menagerie” episodes was because they needed episodes fast, so they threw in the pilot, “The Cage,” as a gap fill. Second, the Star Trek universe has been well established, and current showrunners have many resources at their finger tips, such as the internet. They can easily research if they are being true to canon, besides having people on staff to do that. Third, just because a particular series of Star Trek has continuity issues doesn’t mean that each series is equally egregious in this regard. Discovery takes the cake. Finally, current standards are higher. Most viewers expect writers to be better at avoiding continuity issues than their counterparts in the 60s and 90s, especially since many people have to pay to watch Discovery like they do with superior shows like Game of Thrones or West World. Discovery added unnecessary elements such as holographic communication and even admits in the latest episode that it was unnecessary. This can be said about several of the major logical contradictions such as Section 31. Yes, other series have canon issues, but Discovery is so divergent from the TOS universe, that it is about time the showrunners admit it is a reboot (nothing wrong with that). However, it is so burdened with its own continuity issues that it need some great writers to repair the nonsense. No reason not to learn from them. ALL the shows had canon issues…..
Because it’s fiction. It’s literally made up as the writers go along. I just don’t expect 100% consistency with something as old and complex as Star Trek. There’s just a point where I shrug and go MST3k Mantra: It’s just a show. I should really just relax. Those Canon issues were never intentional or out of a blatant disrespect for the source material though, they were always accidental, hence why the fans usually never got up in arms about them. Sick of hearing about canon. I’ve seen Shakespeare done a million different ways. Nobody cares about canon. At its essence, they are still the same plays. Go see Glenda Jackson play King Lear, btw, if you are in NYC. Rogue One did a tremendous job of connecting to A New Hope! Being a prequel is only a problem with some fan’s minds. Some people have such a set head canon, anything that doesn’t immediately connect to them is a break in canon. Spore Drive? “CANNON BREAK!! !” Not really if the tech ends up being unusable. Maybe the Jahsep insulate the mycelial plane making spore jumping impossible. Ridged Klingons? “CANNON BREAK!! !” Perhaps the contagion was isolated to a few planets in the Empire and the afflicted are shunned as outsiders until L’rell unifies the Empire by the time of TOS. If they had blown up Vulcan or something like that, THEN there would be a problem. Voyager maybe my least favorite Star Trek series but now that we had one series with a starship lost in another part of the galaxy far from home, I often wondered if the idea ever came up to have a starship lost in time or in another universe so I am hoping that they go through with this idea and send them into the future. Can’t wait to see next weeks episode. On the contrary: I believe that the “single ship lost in the Delta Quadrant” theme ultimately torpedoed VOYAGER from the get-go. One of the things fans have loved about every iteration of Trek are the characters’ family relationships: Jim and George Kirk, Spock and Sarek (and now Michael Burnham), Picard and his brother, Riker and his father, Data and Dr. Soong, the House of Mogh, T’Pol and her mother, and on and on. And that’s before we even get to the crews’ friends and supporting characters like Garak and Erika Hernandez. VOYAGER had none of that. It couldn’t. Janeway’s boyfriend? Seen once, never heard from again. Then there were the protagonists. Again, who doesn’t love Kor, Kang, and Koloth? Tomalok? Except for the Borg — which were VOYAGER’s one strong point — they couldn’t have memorable recurring villains. There were some gripping one-offs (Annorax, Capt. Ransom), but not ongoing relationships. And that one-off nature led to plenty of duds, too, like the Kazon, the Vadawaur, the Hirogen (aka space Nazis), etc. This is NOT the model DISCOVERY should replicate. It is fundamentally flawed. The crew of Voyager had to turn to each other as family members. It’s kind of the backbone of the series. – The riveting Tom Paris-B’elanna Torres romance (which of course led to her going into labor at The Time Called for By the Script). Actually I loved the Voyager premise! I liked that literally everything was new, with every alien and planet they ran into. It felt like TOS because it was in a part of the galaxy we were being introduced to for the first time. I agree most of the villains had to be mostly one offs given the nature of the show but I didn’t mind that either. We had enough of that with the other shows and DS9 was running at the same time which was mired with the Dominion war so I was fine VOY was doing something different in that regard. And yes, we had the Borg from season 4 on anyway. But all that said it may not mean that will happen to Discovery either. Even if it lands in a far flung future, there will probably be a Federation around (according to future timelines up to the 31st century, we know it still exist then at least) so they may just be part of that Federation and have recurring species like before, just in the future. And as you point out, then there’s the Borg — which they did well, but whose introduction was a recognition than a never-ending diet of planet-of-the-week was, indeed, a problem. I don’t mind having certain analogies to villains. That’s what Star Trek always does, especially the Nazis (but that seems to be in a lot of sci fi and even fantasy). I just didn’t need having the same villains for 7 straight seasons. I liked every year we met someone new at least. The Borg was ALWAYS going to be a big part of Voyager. They are a big part of the Delta quadrant. It was only a matter of when. I don’t mind *analogies*, either, but on Voyager the Hirogen literally wore SS uniforms, and Janeway was in the French resistance. Yes exactly how it was done in TOS as well in Patterns of Force when they beamed down to a planet that literally resembled Nazis Germany. Or in Enterprise when they traveled back in time and saw Earth under Nazis rule by the help of aliens in Storm Front. Those episodes also had everyone in SS uniforms. And unlike those, Voyager was just a holodeck simulation. But this is familiar territory for Star Trek and as said sci fi in general. Not saying you have to like it, but that has little to do with the main argument of a ship being lost somewhere. No matter what the premise is its still Star Trek and they will always use certain elements all the shows uses. And Trek loves its Nazis lol. Lighten the tone? Have our characters have a little fun? Am I watching the same show? And who has reduced Tilly’s development to a sitcom auto-laugh. Ms. Paradise: while you seem well intentioned, you have a good ways to go to demonstrate that the show didn’t get worse since you joined the writers room. Many of us were very concerned to hear that there had been an unhealthy situation between the writers’ room and the previous showrunners, and we’re giving season 2 the benefit of the doubt, but the number of voices that have said that they were surprised to find themselves disengaged after Project Daedalus is too high. Some good moments, especially from Kim and Lippoldt. But really, did you and Kurtzman really thing that this is what the audience was looking for? You know what TG47, grow up. Here’s the thing: you dont write for TV, you don’t write for film, you dont write books. You have literally no idea what the writing process is like and what these talented people go through day in and day out doing something they love TRYING to make a show they want people to enjoy. I get it, you’re a Star Trek fan, we all are and I’m sure you feel entitled to trash something when you dont like the direction it’s taken but there’s a difference between criticism and just plain crapping on something done by a talented team. When you really stop and think about it, especially when you address the person directly in your post as if you’re reprimanding them, the disrespect there is BLATANT. This isn’t even a Trek09 issue where someone on the team is constantly saying how they were never a Star Trek fan but a Star Wars fan instead. So dial it down a little. Or at least have some respect for the team who works on this show. There’s some previous Trek that I didnt like but man do I respect everyone involved who kept it going and wanted to tell their story. I hope Ira really talks about this in the DS9 doc so maybe the people who need to will finally get it. That team was certainly disrespected by a portion of the fanbase. Not sure how long you’ve been following here, but I’ve been a defender of Discovery more than not. My starting point is to give the creatives the benefit of the doubt. And unlike many I’ve had nothing but positive things to say about the production design, costuming or make-up. As this was a thread specifically about Ms. Paradise’s media messaging to us, to fans, in advance of the finale, I was responding to that. I’m not on Twitter so I can’t respond there for her call out there to fans for reaction. I found her enthusiastic, but out of touch. And she comes across as so in the groupthink and caught up in her spin to the point of losing perspective. I’ll take your view as a view, as I like to be in civil boards too. I will also note that you are making a number of assumptions about who I am and what I have done, which are in fact inaccurate and, in that disrespectful. Someone else said that we shouldn’t have gatekeeping either way here. Please don’t try to shut those of us down who are disappointed that the end of this promising second season is not what we’d hoped. Your last comment there is exactly what my post is about. Making that comment is totally fine but you flat out said “Ms. Paradise: while you seem well intentioned, you have a good ways to go to demonstrate that the show didn’t get worse since you joined the writers room.” That’s not even criticism, that’s straight up snark and disrespect. And I singled you out with my comment but it’s an overall issue that’s really been bugging me in this fandom and others that I’m a part of. It’s as if someone can’t simply dislike an episode or show anymore but snide comments have to be made about the team behind the show or episode. I mean hell, theres a portion of fans who act like the very mention of Gene Roddenberry’s name means they have to instantly tell you stories about his vision caused more problems for the franchise than helped it. And you’re right I dont know what you do or dont do in your own life and I apologize for the assumptions. Thanks for the apology PEB. It’s not just snark. It’s sincere disappointment in the face of hype that seems to miss the point. Check out the average of critics’ (professional) ratings on Rotten Tomatoes or Imdb for this season’s episodes. They are actually lower for the latter part of the season. I don’t necessarily agree with critics’ reviews, but it’s a documented trend. The showrunners are using PR opportunities such as Paradise’s interview on The Ready Room and Syfy to reach fans and promote positive buzz. As I noted on another sub-thread below, they may be doing more harm than good in their past couple of outings. By contrast, the CBS Discovery Twitter is doing much better… but it did solicit reactions to Paradise’s spin. The fact that a lot of the reaction they got from fans was negative and disappointed is clearly getting you down. I get that. But one of the key things in marketing is to adjust the message when you need to, even if you can’t adjust the product. Season 2 is in the can production-wise, and has been since before the feedback started coming in. What Kurtzman and Paradise can do is moderate and be a bit humble in order to convince fans and critics that season 3 can build on the strengths of season 2, and not continue its apparent run off the rails. That’s the thing fans do that gets right up my nose. Contradictions, continuity errors and canon inconsistencies are not contravening real world facts. And in far too many cases, ‘CAN’T BE TRUE’ is a rallying cry for a perceived canon violation that is based in ‘it’s never been mentioned before’ as opposed to ‘it’s very difficult to reconcile these two contradictory events’. I would wish that Trek fans would have taken the lesson from the show that ‘absence of information is not proof of absence. But then, I had a great deal of difficulty with the Xindi arc in Enterprise for much the same reason. Prequels seem to always be pushing at the boundaries of how much can be added without undoing what’s been done before. TG I just wanted to say thanks for responding as thoughtfully and openly as you did. Star Trek is #1 in my heart but a close second is Star Wars and then there’s DC Comics and a host of others. I know all the decisions that are being made in this modern era of storytelling aren’t all what we want them to be -which is fine- but my response yesterday was the culmination of some people I’ve seen in comments here, on twitter (where they’ll tag actors and writers and bash the show), and comments I’ve seen and heard during Star Wars Celebration about things Star Wars fans didn’t like in the previous film. True criticism is great and often leads to rich dialogue between fans and sometimes course corrections between the team behind the franchise but it’s become toxic in so many areas now. I was actually getting nervous for the JJ film actors and Disco actors when it comes to STLV. I would hope there’s never any boos from the audience when they’re on-stage or talking. IDK, just been my pet peeve lately. This is how I really felt about this episode. The haters have won despite our victory of a third season. Yep. I have come to hate Trek’s critics inside fandom, especially since Discovery came alone. These people aren’t about creation, they are about destruction. I thought Trek was on it’s arse with the JJ movies, they really weren’t my thing but I understood that some Trek was better than no Trek. Now, as you say, what Discovery was to this point is now coming to an end and they have won. Hate fans with legitimate complaints? Bridge or no bridge, the writing was bad and the main characters weren’t liked. Discovery behaves more like a CW teen show than a cerebral sci fi property with 5 shows of precedent that proceeded it. Nevermind it is behind a paywall so other should rival series from pay channels. I don’t mean to be argumentative but the reception by the fans speaks for itself. I agree about the Abrams movies though. While not perfect, I enjoyed them and thought the fan hate was overstated. Not so with Discovery. This show deserves the negative feedback. Ahem. Could you tell me the “CW teen show” that addresses topics like religion versus religion, fate and free will, the nature of leadership, etc.? There’s been next to no angsty relationship drama on Discovery this season, save for Stamets and Culber, and even that’s in small doses that have generally been well received. “Next to no angsty relationship drama on Discovery this season”…? It hasn’t been original enough and the issues seem more forced then natural. Michael’s character is to forced as well and I we hardly even know the other casts names or care about them. When someone dies there is no emotional episode because they all feel like extras. Sure, I can tell you the teen shows that deal with those themes. Felicity, Dawson’s Creek, 7th Heaven, Flash, Arrow, Supergirl, Charmed, Buffy the vampire Slayer, beauty and the beast, supernatural, and countless others. Yes, I hold trek to a higher standard than those shows. Beer pong? Tilly? Love triangles? Mommy issues? Learning disabilities? You can pretend not to see it but it is most definitely there. No other Trek series was as juvenile as this one. ‘Mommy issues’ is just your shorthand for disparaging dramatic conflicts that you don’t happen to find interesting. It’s a meaningless term otherwise, and certainly doesn’t represent any consensus view within fandom. Hard to take seriously the complaints about Discovery being dumbed-down Trek suitable only for teenagers from someone who found the Abrams movies enjoyable. For while there’s been worse Trek on offer, on occasion, never in my forty-years-plus love affair with this franchise has there ever been a greater insult to my intelligence than Trek 2009. Speaking as someone you hate, I say this as bluntly as I figure I can get away with: get stuffed. The implication is that you wish people who dislike “Discovery” would shut up about it. Well, I can speak only for myself, but: not a chance. I’m 44 years old, and I’ve loved “Star Trek” for as long as I can remember. I’ve literally grown up with it. I’ve stepped away from it at times, and I’ve had complaints at times, but it’s never been out of my mind. That being the case, I hold the people who are making new versions of it to a high standard. Why wouldn’t I? And when I feel as if the people making “Discovery” drop the ball, why wouldn’t I call them out for it? Sorry, but for the most part I don’t feel like the current creative team have the foggiest notion what “Star Trek” is actually all about. Not everyone agrees with me on that; most people disagree with me on that, in fact. But that’s my perception, and it’s apparently not going away until at least season three, and the odds of me shutting up about it are next to none (especially since I’ve got no qualms about being effusive in my praise when I feel praise is merited). So hate away, Marty. Ain’t no skin off my nose. Such as 1960s-era interior design skills, apparently. I feel certain you think you just made a point. Just shows that shiney cgi isn’t required to make it Trek. Spend a fraction of the cost on special effects and get some decent sci fi writers and a lot of the complaining would be pacified. I appreciate the attention to detail on sets but find it somewhat inconsequential with characters like Burnham, Tilly and Stammets carrying (or not) the show. If it weren’t for the very solid addition of Pike, I wonder how many more cancellations CBS would have faced? Sure the cannon complainers are a bit much at times. I didn’t really understand a lot of the complaints during Enterprise in this regard. I really enjoyed Enterprise. Nevertheless, there are other more pressing complaints about Discovery like poor writing and character development (or just dislikable characters) that shouldn’t be brushed off so easily. 32 percent audience score on rotten tomatoes for season two seems to say that it isn’t just a very vocal and toxic minority of fandom worried about cannon that are complaining. The difference between this and other shows is that it is behind a paywall so expectations are higher and trek has very loyal fans who won’t simply turn the channel and forget about the show but rather will make their disappointment known. CBS doesn’t get to benefit from the property without accepting some of the feedback that go along with expectations for it from the fans that make the property valuable. Otherwise call it something else. If I order eggs and you give me oatmeal, don’t be surprised if I point out that oatmeal isn’t what I ordered! There are plenty of different ways to prepare eggs that are still eggs but allow the chef some creative freedom. Dumbing down trek isn’t really one of them though. Trek fan, we don’t often agree, but in this case I find your analysis spot on. Wes…I share your concern that efforts to overcome the barriers to enjoyment for the core market have contributed to the incoherence of Discovery. And I believe firmly that Enterprise, and to a lesser extent Voyager were compromised by this. I think that Kurtzman is on the right track offering different products for different niche audiences…. But all of them need to stay true to Trek, and not break canon just because the writers think they have a cool idea. Enterprise was a turgid, dull-as-dirt misfire that is almost completely forgotten by fans, let alone general audiences, not to mention being an almost complete critical and ratings failure. Yet you say it compares very favorably to Discovery. How so, exactly? Hate to break it to you, but if DISCOVERY were underperforming, much less on the verge of cancellation, CBS wouldn’t be unveiling new Trek shows as the centerpiece of its online platform, CBS All Access. Instead, new Trek projects are sprouting up faster than Stamets’ mushrooms. In Hollywood, nothing succeeds like success. And CBS is a publicly traded corporation that is accountable to shareholders and the Street — and, thanks to pesky securities laws, certainly doesn’t get to mislead those constituencies. In short, CBS’ target audience, some of which includes Trek fans, is eating it up. This is, of course, not to say that you have to like Discovery or watch it. But your habit of issuing recommendations (“CBS doesn’t get to benefit from the property without accepting feedback!”) is class-A armchair CEO syndrome. And on that note, Seasons 2 makes it patently obviously the showrunners listened to feedback from Season 1. Klingon hair, and all that. Bwhahahah. It costs me about as much per month as a latte. And I don’t do frappaccinos. Next? Incidentally, on “those fake Trek movies” — surely you’re aware that Paramount controls the movies, and CBS the TV shows. If you dislike the JJVerse, you can’t pin that on CBS and DISCOVERY. DISCOVERY shares some design motifs with the JJVerse, ’tis true. But dramatically, the two couldn’t be more different, for the most part. ah I see. The fan base loves Discovery and just a few people in a basement are tanking audience reviews all over the internet. I don’t buy it. The show isn’t very good. Yes, Harry Kim and Neelix were annoying characters. Which characters in Discovery measure up to Seven or the Holographic Dr though? Which make me reflect on what makes me human? Enterprise had issues but was very Trek like. It captured the exploration vibe set down in tos quite well, even if the character development and cannon issues weren’t always perfect. The Abrams movies had loads of problems. Nevertheless, I enjoyed them. The movies have always been very different than the shows. I suppose I have very different expectations for each. I’m not an armchair CEO. I am (or was) a paying customer and lifelong Trek fan. I don’t think it is disrespectful to share my opinion (which is shared by most Trek fans I know personally). Again, the show wasn’t free. Disco fans are passionate in their defenses of the show. Their defenses border on irrational though. Either those who dislike it are racist, homophobic, or sexist, have no lives, lack respect, and/or they are part of an annoying minority of fans that won’t shut up and potentially tank online ratings in an effort to bring the show down. I suppose the last is most accurate when describing me but despite theories about how wonderfully this show has been received, I doubt I am in the minority and I haven’t really ever rated the show anywhere. I have shared my opinion though. As for breathing, 2 full seasons is more than enough time to get traction. I think discovery now has an identity. How long should we wait before having an opinion? 3o-40 episodes? That is pretty unrealistic. Are fans who like it the only ones who are allowed to discuss it? >I’m not an armchair CEO. You certainly are if you’re telling CBS that “they don’t get to benefit from the Star Trek property without accepting feedback.” Because actually they do. They *own* the property. >I don’t think it is disrespectful to share my opinion (which is shared by most Trek fans I know personally). And there’s a plethora of evidence that Discovery has been well-received. Setting aside the fact it’s been renewed, CBS is making *more* Trek series. That’s exactly the opposite of what they’d be doing if Discovery were a ratings dud. (Network execs need to keep the Street happy.) And CBS’ senior management is on record as being pleased with how Discovery is done. If you’re a publicly-traded corporation filing 10-Ks and 10-Qs, you don’t get to make misstatements of material fact when you talk to the press. The victory of a third season belongs to all Trek fans, regardless of any individual levels of criticism. I’ve been there with DISCO since day one. I was even one of those few who defended the pilot when it didn’t seem to be the trend to do so. I didn’t have a problem with a lot of the timeline issues others did, and which maybe they are retconning now. My problem was more with characterization and narrative construction as the season wore on. But I always valued having more Trek, and still do. To me, having constructive conversations about the possible futures of the franchise has long been a part of being a Trek fan. I really don’t like this idea that one person tries to claim “our victory” of a third season while bashing everyone else, who may have expressed some of the concerns you raised, but who have been no less supportive of the show overall. Yeah, have to agree. Not thrilled about a reset button being hit just so the writers can get out of a corner they’ve painted themselves into. Not convinced it’s going to solve the show’s main problem: the writing. How’s about we actually see what happens in the finale before we start talking about whether we like it or not? Wow, now there’s a notion. Let’s wait and see. Hopefully, even with the changes that are coming up, the show will stay true to its first two seasons. I think the way you are separating the fandom is wrong and very dangerous in the long run. I don’t think there is an us or them mentality here. At least, there shouldn’t be, this would only make the gap between the fandom even more. I think we should look at both sides with open minds, this is how the philosophy of Trek works. What you are doing is bsically reverse gate-keeping and its not cool. Am I the only one not convinced that Saru will be the captain in the third season? I think that Doug Jones has already told us the answer : Saru know that Burnham is always the one to save the day. It would have been very welcome to see Burnham grown into a leader. No you’re not. I suggested this sometime ago as his biological changes provide a neat way of Burnham sidestepping him without killing off Saru.. It might be an interesting twist if Saru actually breaks bad in the next season and becomes the main villain. Just make the guy the freakin Captain already!! If they jump into the future, rotating a new captain every season will no longer make sense so just bite the bullet and make him the captain. And it will be a trail blazer for Star Trek because it will be our first non-human captain in a main role…ever. They may be doing a lot of firsts next season, this should be another. Amen to that! Saru needs to be Captain! If they get flung into the future next season, possibly to a point where the Federation is no longer around or changed to the point of being unrecognizable, who’s to say there will even be a captain on the ship? If they’re no longer part of Starfleet, they may well feel they don’t need to follow its conventions anymore. 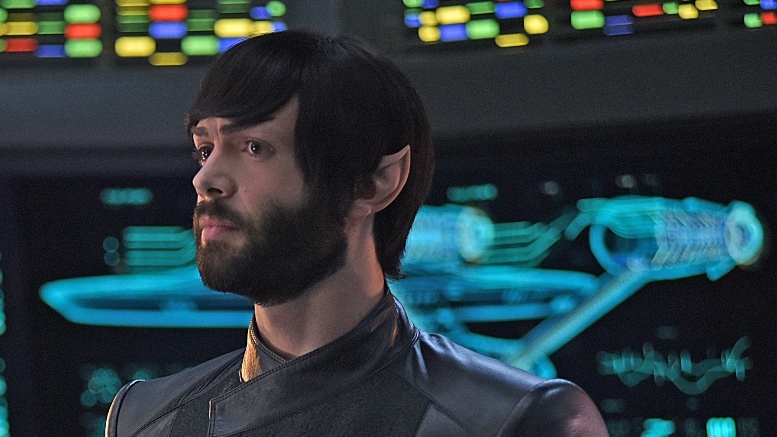 Also, FWIW, if I was a crewmember on that ship, Burnham is the last person I’d want in command. Time and again she has let her emotions get in the way of the mission and made a string of bad judgment calls. I think they’ll still be looking to retain there Starfleet values TonyD even if the organisation no longer exists. Let’s make plans to destroy the ship on the ship that is infected by the AI. Is there any way we could watch the finale as a full 2-hour movie event? Or is that only relegated to the Blu-rays? This is a FANTASTIC show! While I liked Voyager and the others this is my favorite next to Next Generation. The acting is solid and the story this season is better then the first. I absolutely love Discovery. It took me quite a few episodes to get used to it as it seemed a little ADHD and the new look Klingon’s annoyed immensely. I find the story line to be great and we’ll developed. I still love Next Gen and DS9 the most but Discovery has our family glued each week. Love the lighter moments like he Tilly breaking the long dark intense periods. Hope this series runs for many years. The only mystery I care about is why nobody has made Spock start wearing his uniform again. Is he still officially on leave? It hasn’t really been clear what his duty status is once it was revealed that it was the AI that framed him for murder. I’m sure that’s the explanation they’d give, but that’s silly. He’s a member of Starfleet, on an active mission; he should be in uniform. Maybe they didn’t want to put an iconic character like Spock in those silly Discovery uniforms. I hadn’t considered that; you might be onto something there. Agreed on that. I don’t like the Hipster Spock look. He should have shaved it as soon as he realized he wasn’t having a mental breakdown. Because they are saving that for as close to the ending of the last episode as they can. That is almost certainly true. And let’s think about that for a second: if so, it means the producers of this series think it is a grand, climactic moment for us to finally see Spock clean-shaven and wearing a blue shirt again. That’s what these jokers have up their sleeves. Or they’re never going to do it at all, which would be even worse. What a mediocrity this series is. What a squandering of potential. The time is utterly right; the approach is totally wrong. my money is on jet reno and tilly accidentally morphing Cmdr Nhan’s and Lt Kayla’s nano implants along with sphere data into becoming the beginning of the Borg. If they do, I will never stop clowning this series. I just can’t figure out how it got greenlit, much less got to a second season. I kept watching hoping I would discover a good show hidden inside, even if it’s not Trek, but I can’t. I seriously think people are approaching this show with some rose tinted glasses on what Trek has been. This season has been the best single season in the franchise so far. (meaning that the episodes are more consistently decent with fewer duds than other shows, even if they don’t quite reach as high as stuff like Inner Light (though If Memory Serves or Through The Valley of Shadows might be getting up there). I watch this with my monthly Trek parties, and I’ve never seen everyone as excited and engaged in what we’re watching. True there’s snark from time to time regarding stuff on screen, but that’s true of all the Trek shows. I wish I thought this was the best season of the franchise. Boy oh boy do I not think that. What I find the most discouraging is that the attempts by the two showrunners to hype and build momentum for the end of season 2 are having the opposite effect. It’s really sad that Paradise’s spin cited above, and Kurtzman’s at Paleyfest actually are killing interest and anticipation for the finale. I’m hanging in week by week because I always do. We’ll probably watch the last four episodes of the season together once it wraps…but in the meantime our couple watching time is going to The Expanse. Do you recommend The Expanse, TG47? My wife won’t go near Discovery whatsoever, but is a Trek fan. Danpaine, I do recommend The Expanse. It’s violent and all the characters are flawed, but they grow on you as they struggle through ethical dilemmas and experience their world less being challenged. The truly international cast helps with this. There is also a slowly revealed puzzle that a Trek fan can appreciate. I..had to convince my spouse to hang in long enough to appreciate the long form storytelling. The Expanse is based on novels, and one of the co-authors is cowriting the series. A season equals one book seems to work well for that show. I really think that Kurtzman could save Discovery by putting another of the Trek-lit authors in Discovery’s writers room now that Beyer has moved over to the Picard show that she’s co-created. David Mack, Dayton Ward and others know how to make long form Trek stories work while staying true to Trek. The other thing that The Expanse has over Trek is the realism in its production. My spouse was blown away by the way the The Expanse manages the ordinary physics, and all the micro and light gravity scenes …which held their interest for enough episodes to get invested. The Expanse also has a previous Trek producer involved in the form of Naren Shankar I believe. Yes alphantrion Naren Shankar started out as the science advisor to the writers on TNG. He has a PhD in physics. I’ve said it previously – Discovery really needs it’s own Naren Shankar. One of his own earliest writing credits was Face of the Enemy, one of the first episodes that really used Trois’s telepathy well in an espionage context. It really showed that he had a fresh way of seeing what some of the ensemble could be. I was fortunate to be at a con where Shankar was speaking about Trek science shortly after that and couldn’t help be enthusiastic about where his career might go. I concur with everything you said. The world they create is messier, grittier, more akin to something we could see in the next couple hundred years were we to magically dodge the ecological catastrophes starting to manifest. The physics is more realistic. No faster than light travel. No blaster/phaser type weapons but rail guns instead. And the writing is better. It’s out in front of ST: DISCO by a long ways. I see tons of speculation about the outcome. (Is it The Borg? What role does Calypso play? Who’s going to be captain next season? Etc.) I sure don’t remember this level of discussion during Voyager and Enterprise. River Temarc, I saw speculation coming out of the previous episodes, true. But I’m seeing little evidence that the showrunners’ hyping and spinning isn’t giving it legs – extending the discussion – in PR parlance. The Borg speculation on line has largely petered out. The T-1000 nanites largely quelled interest in that. Everyone knows that in some way the arc has to have something to do with Calypso given the Short Trek tie-ins, so that’ not new…the odd new poster on this and other boards will pipe up and post ‘what about Calypso’. The Enterprise bridge and Tamara Deverell’s interview have generated buzz… but I’m talking about the efforts of the showrunners. It’s their job to stoke anticipation and be the frontmen for the series. And I’m saying that they appear to be generating – as the conversation on this thread demonstrates – more angst than anticipation. But I can say that when Ronald Moore and Brandon Braga went out cons to hype DS9 in the early 90s they really built excitement about the series. Why hasn’t Spock put ton his Starfleet Uniform yet? He’s been cleared of all charges. There’s zero reason for him to still be on leave. None, nada, zip, zilch. Pike or Cornwell could have solved that with half a line of dialogue, and in the real world — a ridiculous statement for a Star Trek show, granted — they would have done so long ago. Spock, being a logical person, would likely have done it himself before they had an opportunity. No, this is because the producers decided Peck’s Spock looked appealing in a beard and Earth-tone Vulcan garb, and didn’t want to shake that up. Like so many decisions on this series, it’s a case of misplaced priorities. I dunno. They seem to have confused the Vulcan bowlcut with 1965-era Paul McCartney. It’s clearly a Beatle wig. As a huge Beatle fan as well as Star Trek, it’s slightly odd. In all seriousness, it’s impossible to recast Spock. Leonard made that role. So anything any actor does is going to pale in comparison. Best to just watch it for what it is. I think Ethan’s got brass…lobes for even trying. It’s an amazing opportunity for any performer. We are speaking of Discovery going to the future. In Calypso, we learn that the ship had been abandon in a nebula for 1,000 years. It seems clear now that the computer combined with the sphere data will develop into Zora over the 1,000 years the ship was sitting in the nebula. After hearing the plan in the last episodes, it occurs to me that Calypso likely does not take place in the 33rd Century as everyone assumed but in the 42nd Century. If Discovery is flung 900 years into future next week, it is safe to assume that sometime after that the ship will be abandoned in the nebula. That would mean that the 1,000 years would be from that time, so 1,900 years from the 23rd century. Some evidence that points to that being possible is the fact that Craft does not appear to know what Starfleet is or the Federation. He does state the people he was fighting are called the “V’draysh”, that sounds like (V-daray-shown) of Federation. We know from Voyager and ENterprise that the Federation and Starfleet survive to at least the 31st Century. It seems unlikely that a human from the 33rd Century would not know what the Federation or Starfleet is, ort would mispronounce the name as Craft did. Tack on another 1,000 years, and it’s possible, especially if the Federation fell sometime between the 32nd and say 36th centries. Interesting theory. But what if they are not in federation space, but in another region? They could be on the other side of the galaxy, were the federation is unknown. Or in the PAST in the delta-quadrant. Interesting ideas. And if Michael Chabon has planned all of that out and given the series a direction going forward, then maybe it will be good. If it’s the people who’ve already worked on the series extensively, I have zero confidence in their ability to do anything but make a mediocrity. Our kids haven’t got into Enterprise yet, so I haven’t rewatched it. …I can say that seeing Voyager through their perspective gave me a new appreciation for the series, particularly the early seasons. Enterprise had a rough opening season and had some problems but really picked up steam in the final 3 seasons. If you can get by the song, it really is worth watching. I hope you enjoy it! I lost interest around the beginning of season two and didn’t finish it until years later, at which I realized I’d been a bit of a fool. It’s a strong series; I still think a prequel was a bad idea, but they did about as well with it as they could have been expected to do. ‘Star Trek: Discovery’ Co-Showrunner Says Season 2 Finale Will Provide Answers To The Show’s Mysteries…Like why it is so, but I mean so bad? I lost interest last season. Spent entirely too much time developing the characters. Not enough time on what made Star trek, imagination. >Spent entirely too much time developing the characters. Angels and ministers of grace, help us. I wonder if some of the militant fandom who use all their energy to nitpick every tiny detail actually used that time and energy to do something good in the world, how much more fulfilling their lives would be. It’s a TV show, it’s fiction, it’s not real. It’s entertainment for the masses not for just you and me. Sacrifices have to be made if you want Trek on tv. Sorry to break it to you. Every series had canon issues, every series had mistakes in script and story, it’s normal in television. God forbid when the Picard show airs, guaranteed it’s not going to be 100% fool proof. Corners will be cut, canon issues will appear. That is just the nature of television, no sci-fi series let alone any TV series has always got it right. So now Discovery has a Spore-drive, a Time-Crystal, and a nascent AI. The writers have a lot to play with here going forward. The ship is so advanced it likely needs to be severed from the timeline. I’m liking the show this season, even with the over-emotional soap opera aspects. I’m as skeptical of this show as the next fan, but did anyone else feel the show “re-centre” when we arrived on the Enterprise bridge? All of a sudden I didn’t feel lost anymore. The second we were back on Discovery, I felt so much less connected. Enterprise is a true character on the show. Discovery is not alive. It may as well be a hammer. That ship needs to be alive. Even DS9 lived and breathed and she was a Cardassian station. Food for thought.